All of a sudden there are several NXT books available. Here are several that I have seen and really enjoy. The others, I have not yet had a chance to review. 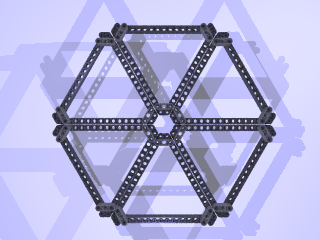 Hexagonal platforms are easily created using any one of the equilateral triangle designs. Here is an image of a large hexagon. In this graphic, the triangles are not connected, but this is easily accomplished using plates. Two 2×4 plates per connection would suffice for most purposes. LEGOs are designed to go together to form rectangles. Here I present some possibilities for equilateral triangles, which can be extended to form hexagons. 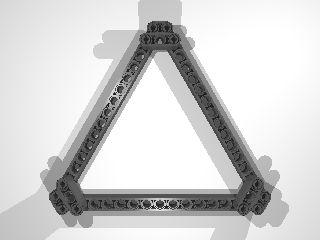 Some of the more recent triangle designs, which I present below are being used in a current design for a tri-wheel drive system for a Mindstorms rover I am currently constructing. These first triangular designs are equilateral triangles (same side lengths), and can be put together to form hexagons as well. These are extremely sturdy constructs and may find use in triangular or hexagonal bases. 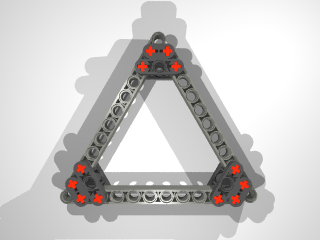 Below is the smallest LEGO equilateral triangle. The parts used to construct it are shown to the right. It often takes a bit of pressure to snap this together since it is a tight fit, so take care when doing so. One can make equilateral triangles of any size this way. 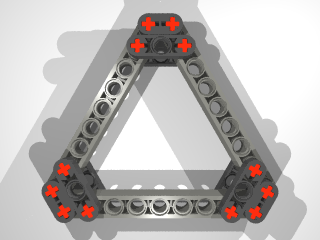 one can use the thin technic liftarms with the small axles to secure the triangle. Here is a rotating image of the result so you can get a good look. The two following designs are slightly alternate forms. One uses beams of length 11, but is offset slightly so that there are empty peg holes at the corners of the equilateral triangle. The following design uses beams of length 9, and lacks holes at the triangle corners. 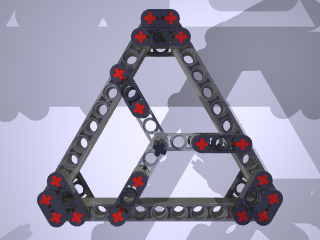 The following triangle is composed of beams of length 11, and has a a 3-blade rotor in the center to act as an axle. 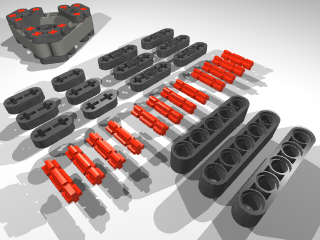 The parts list and instructions can be found here. An animated version illustrates how the braces hold the central rotor in place.